Around Christmas time I went to see my parents who said they had something I might like. In the depths of packing to move, a tiny part of me could not help but think about how I was supposed to be getting rid of things before we moved not adding! But then I unwrapped these wonderful mugs and straight away started to plan where I would put them in our new house. There are several things that I like about them. One: they are proper mugs. Something you can really get your hands round. Two: I really like the letters on the sides. Not just because of what they mean but because of the font used. I am no UI designer and could not tell you what font it is, but I do know that’s how I draw letters, with the little serif tails. And then the delight that my parents, who maybe do not completely understand what I do, (but then I could not tell you exactly what most other jobs entail either) saw the letters U and X and thought of me. 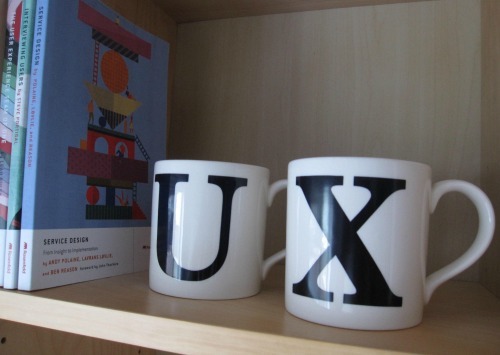 Driving home with a smile on my face I could imagine conducting user research and giving my user the U mug and keeping the X for myself. 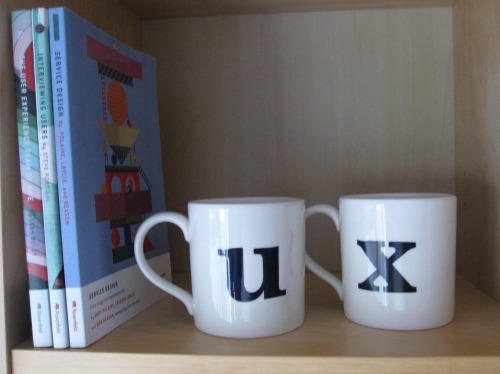 In truth they will probably be used as bookends for my UX books at home (as I do not drink hot drinks). All I know is that they cannot be separated now. Thanks Mum and Dad.